GATHER 'ROUND THE FIRE, KIDS! Uncle Sandro has some good news~ to tell ya. 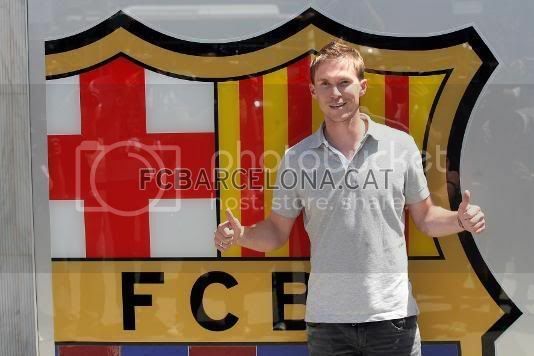 » Hleb has signed with Stuttgart on a 1 year loan. » Cáceres is set to sign with Juventus on (supposedly) a 1 year loan, he's already passed his medical. Monday 3 Aug » Event to set out the 'More than a Club in the World' project, the activities of the FCB Foundation and the club's global alliance with UNICEF (17:30). Tuesday 4 Aug » Visit to Microsoft's HQ and House of the Future (17:00). staying at the SLS Hotel in Beverly Hills. El Clasico countdown: 3 days! Q: Are you especially motivated to play against Real Madrid at Camp Nou? + The latest speculation as regards Real's make-shift backline is that it will be Metzelder-Ramos-Cannavaro-Salgado. That's right, Salgado to mark Messi (if Pep sees fit to put Leo on the right again). + On the Barca side, everybody's doing fine, except Aleks Hleb who has a fever and had to miss training. + The official website makes my life easier with a series of preview articles: one focusing on the influence of Dutch players on first Barca and now Real and on Juande Ramos' year in charge of Barca B. + Xavi spoke to the press and was properly very cautious about Barca's prospects. + Injury news first: Aleks now has medical clearance, so he'll be fit to play in Bilbao. Dani's probably going to be okay too, after missing the Atletico game as a precaution. That's the good news. The bad news: Pedro broke in training with the Spanish U21s, and he's out for a month, Guddy got an injury playing for Iceland and will be out for at least a week, and Yaya's got some sort of knock from playing for the Ivory Coast which is not terribly serious but might be enough to rule him out for the Athletic game. + Quick international highlights round-up: Titi and Andres both scored fantastic goals for France and Spain respectively [both definitely worth watching], Leo now has 8 goals in his last 9 games, Sammy has now scored 10 goals in his last 11, Puyol saved the day for Spain (and scored a goal in their other game) and Sergi Busquets made his debut for the Spanish U21 side with a goal. + the Fundacion FC Barcelona's collaboration with UNICEF is expanding to cover projects in Malawi and Angola as well as Swaziland. The article also details the good work that's been done in Swaziland already. + Leo made his official first team debut four years ago. Seems like longer, to be honest. So much has happened. + On the contract extension front, talks for Sergi Busquets' new contract have begun. There's a lot of BS flying around about other clubs poaching him, but I wouldn't worry. Firstly, he's a cule who is the son of a cule who works at the club. Secondly, he shares an agent with Guardiola and said agent has a record of dealing well with the club. As long as Barca don't screw him over economically, we should be fine. + Further contract news: it has now emerged that the club sneakily signed a new contract with Leo a couple of months back and just didn't tell anybody. There's no extension involved - it still goes until 2014 - and the buyout clause is still an astronomical 150 million euros, he's just earning a lot more money now. No one's sure as to the figure, but the rumour that was floated a while ago was 8 million euros + up to 4 million euros in performance-dependent bonuses per year. He's signed a four-year deal with a 90 million buy-out clause, and has cost Barca the rumoured 15 million euros. At the presentation, attended by a watchful Thierry Henry (his former captain at Arsenal), Aleks was very eager to please: he joked that he was willing to play in any position, including goalkeeper. In line with those comments, Guardiola praised his versatility and also his technical skill.